Q: How does the NeuroSuit help? The NeuroSuit has a vest, shorts, knee and elbow pads, shoe attachments, gloves and even a hat if necessary. All these pieces are worn over the patient's clothing and uniquely connected by bungee type bands. These bands provide compression, provide external support and bring the patient into correct alignment with improved posture. The patient receives strong yet gentle feedback from the bungees teaching new motor patterns while increasing strength, balance, coordination and improved body awareness. Q: Can they wear the NeuroSuit all day long? No, the NeuroSuit is usually not worn more than 2 hours at a time. While in the NeuroSuit all the systems are elevated due to the components of exercise such as blood pressure, heart rate, blood volume and kidney output. Therefore 2 hours at a time is typically the longest length of time to wear the NeuroSuit. However, once out of the suit it is possible to continue other exercises or activities as the sensation of wearing the NeuroSuit remains with the patient for a couple of hours after removing it. This is an optimal time to practice the newly learned skills in the suit and repeat the skills while out of the NeuroSuit. Q: How will I know what exercises to do in the NeuroSuit? 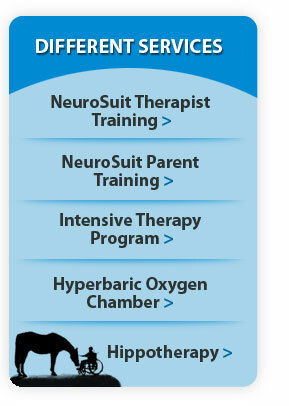 NeuroSuit training includes learning different exercises to do while in the suit in order to accomplish the set goals. You will receive an individual and customized diagram for applying the suit and specific exercises to do while in the NeuroSuit. Q: How will I know where to place the bungees and how tight to make it? Customization is key in the fitting and bungee placement for each family purchasing a NeuroSuit to use at home as part of their home exercise program. During training you will learn how tight or loose to apply the bungees and will even need to demonstrate to the instructor competency to pass the course. Q: How can I sign up for a training course? Simply contact us at NeuroSuit@gmail.com to inquire when the next training course is available. Q: What if I'm not sure if the NeuroSuit is right for me or my loved one? We understand you may have further questions pertaining to the benefit of NeuroSuit. You may email us atNeuroSuit@gmail.com and one of our friendly staff will contact you right away to address your questions. Q: Is there a minimum age before the NeuroSuit can be used? Preferably the minimum age should be 2 years old. Special consideration will be taken for very young children based on their size, weight, muscle tone, strength and present functional level. Please fill out the assessment form to begin the determination process to find out if the NeuroSuit is appropriate for your child. Q: How quickly could I see results & will the results last after the NeuroSuit is off? Immediately! Since improvement in posture is one of the main goals in use of the NeuroSuit which leads to better motor performance, once the NeuroSuit is applied posture is typically improved while wearing the suit immediately. Results in motor skills are all as unique as the individual themselves. It is dependent on the nervous system and finding the right combination of time, duration and intensity. Q: How can I get more information for my patients? Have your patients contact us at NeuroSuit@gmail.com or Fill up the assessment form to submit information to inquire whether NeuroSuit is a good choice for their loved one. Q: Can I get certified in NeuroSuit and NeuroSuit Method? Only a person with a physical or occupational therapist license may obtain certification in NeuroSuit and the NeuroSuit Method. However, parents or caregivers may take a training course and learn how to use the NeuroSuit to perform a home exercise program with their family member.